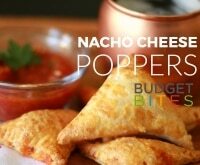 Melty, gooey, and totally addictive, cheese appetizers are pure party pleasers. Whether you slice, grate, or cube it, toss some cheese in the slow cooker and you’ll end up with cheesy perfection. I get that you’re short on time, and that’s why I’ve rounded up some incredible slow cooker cheese appetizers that make party prep absolutely easy. And did I mention cheese? Yup, each of the 14 recipes below is coated or stuffed with glorious, magnificent melted cheese! 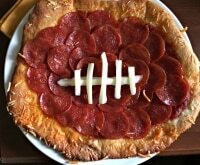 Football season is the perfect time for appetizers. Gather up your friends and settle in for some fun because each of these tasty one-bite appetizers is like a celebratory touchdown dance in your mouth! Perfect for pretzels, this extra-easy three-ingredient dip is a slow cooker winner! Just toss everything in your crockpot an hour before party time, stir every 20 minutes or so, and serve with pretzels. 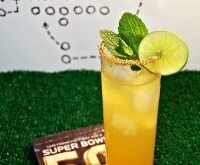 This recipe is guaranteed to make game day delicious! 1. Stir together all ingredients in a small slow cooker and cover. 2. Turn heat to high and cook for 1 hour, or until melted, stirring every 20 minutes or so. 3. Once melted, turn to low. Continue stirring every 20-30 minutes, to keep the dip from burning. 4. 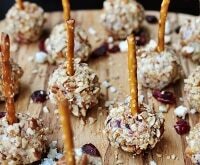 Serve with pretzels and enjoy! 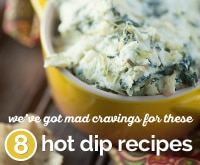 Load those chips up with these hot dip recipes — from Spinach & Artichoke to Seven Layer Dip, each one is a party in your mouth! Get the incredibly delicious and addictive taste of Buffalo wings in an easy-to-serve dip. 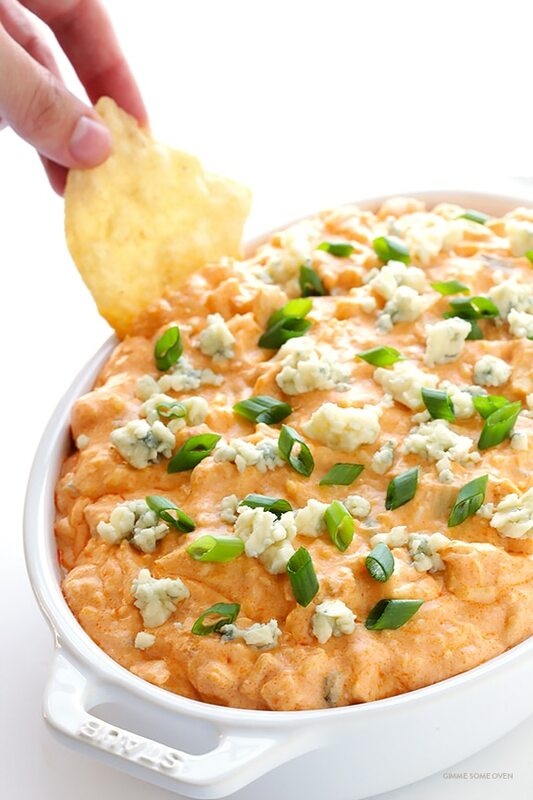 You’ll never want to deal with messy wings again after you make this amazing Buffalo Chicken Dip. 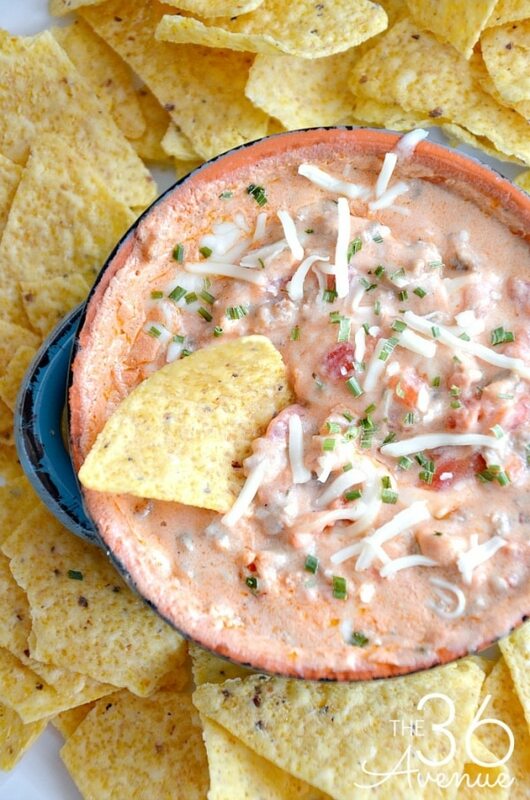 Want a crowd-friendly, chip-licking party dip that you toss in the slow cooker and melt into cheesy bliss? 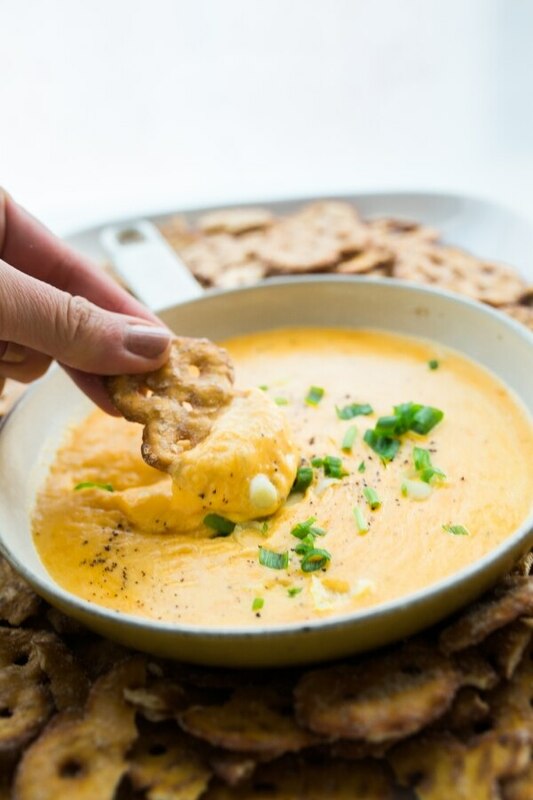 Put this zesty Double Cheese Queso Dip on your party menu and I guarantee your guests will devour every last bite! 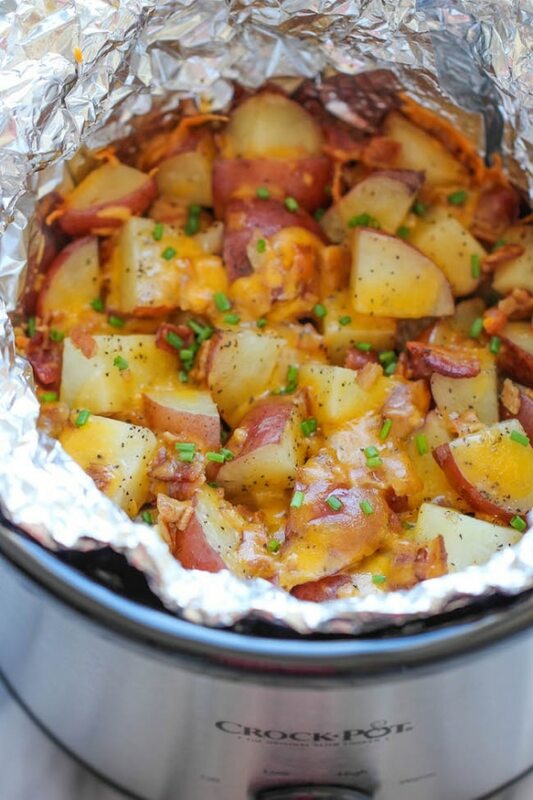 Brilliantly flavored, these Cheesy Bacon & Ranch Potatoes will be the hit of your party! Set out some toothpicks or mini skewers and let party-goers spear away at these deliciously cheesy potatoes. Love bacon in everything? 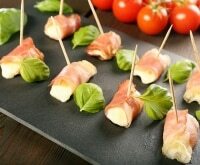 Try these 12 mouthwatering bacon appetizer recipes! 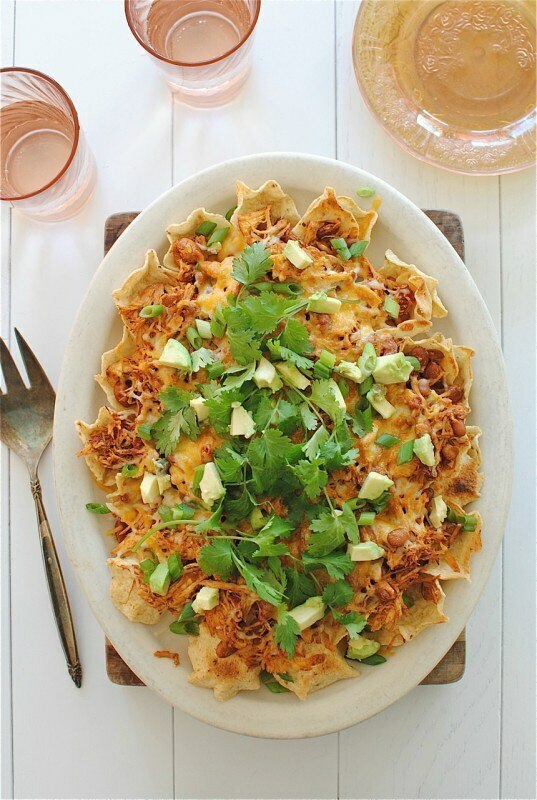 Your guests will make a beeline to these Chicken Nachos. 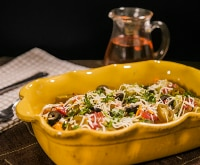 Piled high with the most tender, pull-apart chicken and pinto beans, melted cheese, and your favorite toppings, these nachos are perfectly party-worthy. Slow cookers + chicken = a recipe for success! 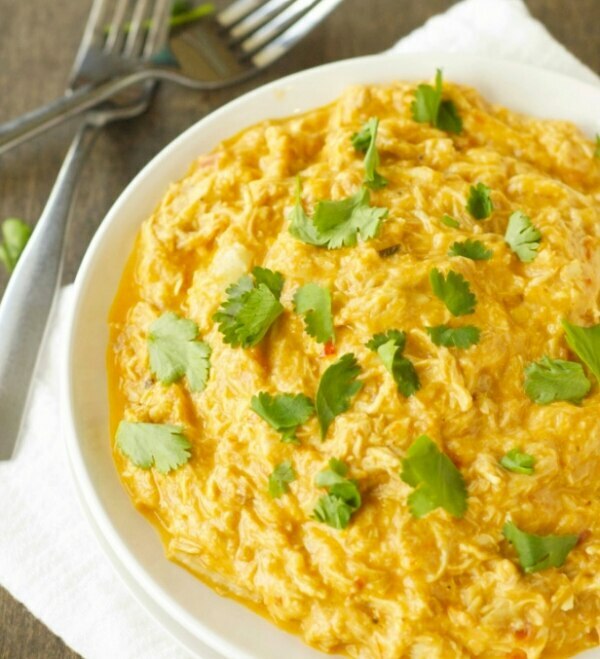 These 15 slow cooker chicken recipes are the perfect way to whip up dinner in no time. Warm and welcoming, this Broccoli-Cheese Dip is perfect for fall and winter parties. Whether you’re cheering on your favorite team or just gathering with friends, this delicious dip is the way to go. Bread, chips, tortillas — they’re all just vessels for getting some of this Cheesy Adobo Chicken Dip in your mouth. 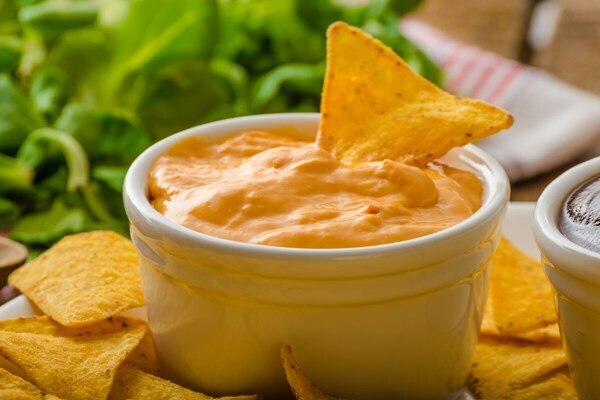 Go bold and spicy or keep it mellow, but either way, this amazing dip will get devoured! 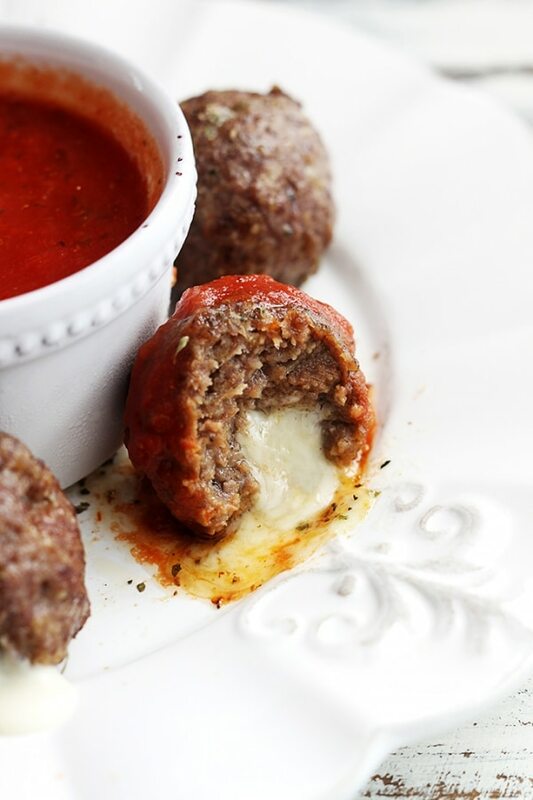 You’ll never look at a meatball the same way once you get a taste of a Mozzarella Stuffed Meatball. 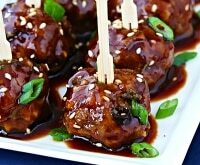 These amazing meatballs are stuffed with gooey, cheesy goodness, and they’re perfect for a party. Stuffed to the gills with melty cheese, these Cream Cheese Tacquitos are out-of-this-world good. 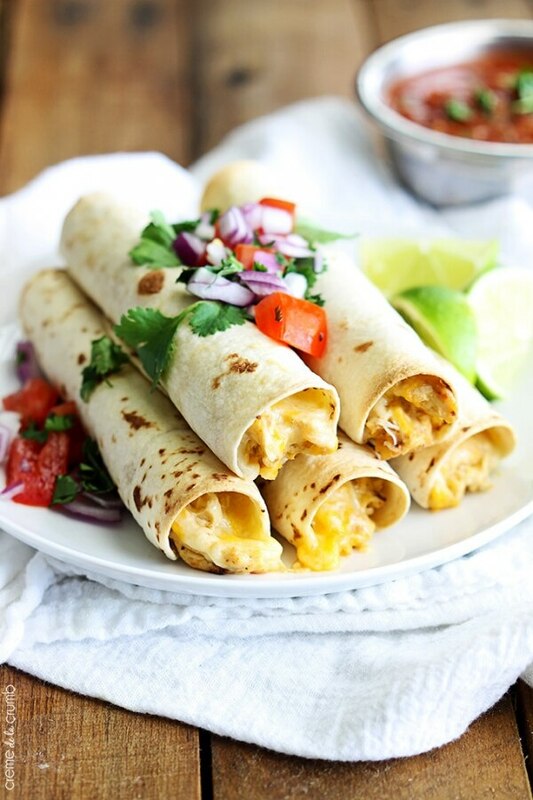 Stack a plate of these cheesy taquitos for guests to grab and serve with disposable cups of salsa for dipping. A meat-lover’s dream, this Cheesy Sausage Dip features ground sausage paired with two different kinds of melted cheese. 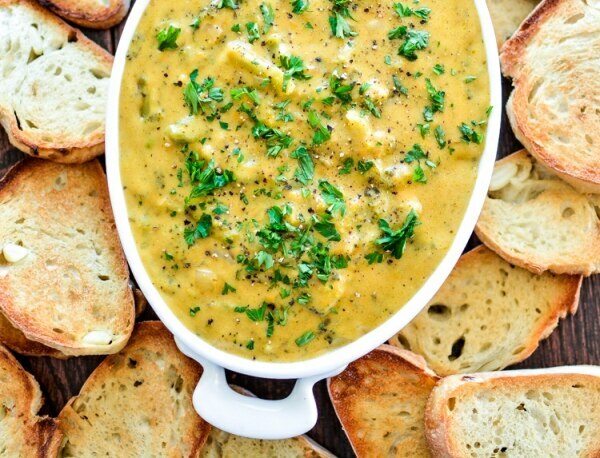 With just the right amount of spice, this dip is a party favorite. 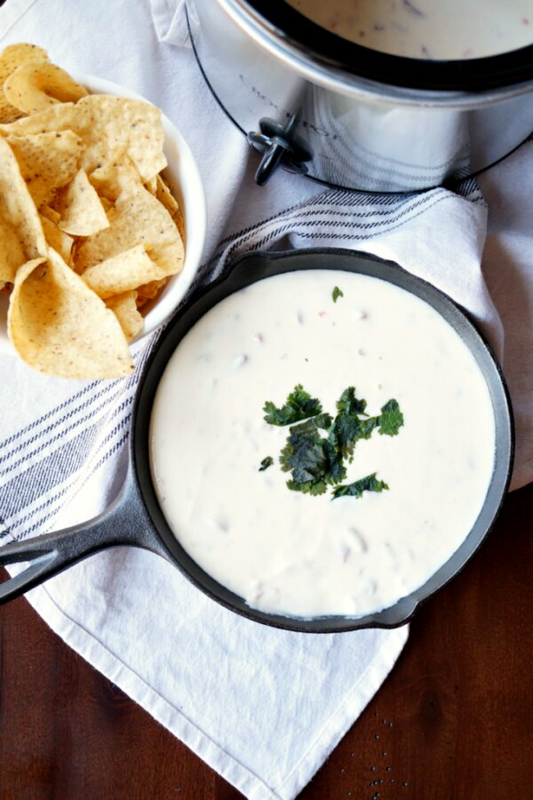 This magical white dip will be the “watercooler” of your party — guests will gather ‘round for a taste of this addictive White Queso chip-dipper. 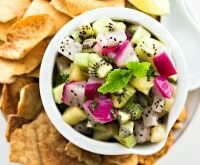 A ridiculously simple appetizer, this five-ingredient dip is just what you need for a stress-free party. 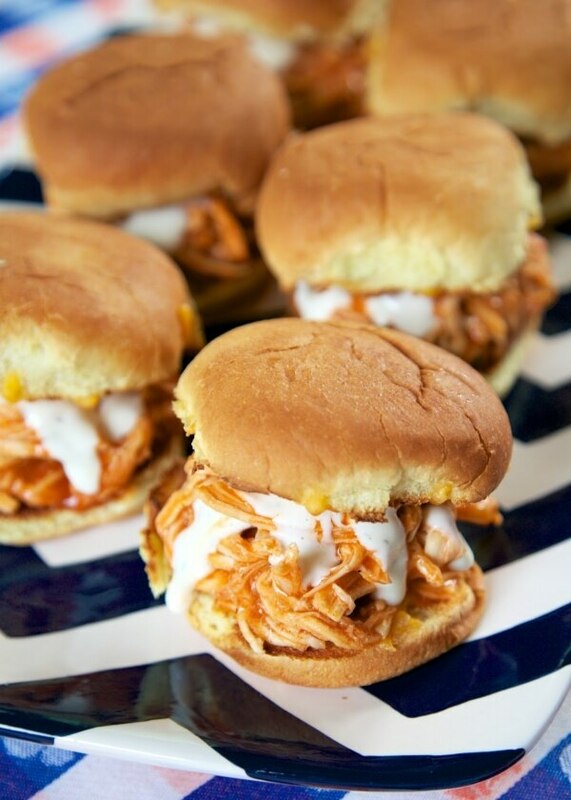 Perfectly portable, these Buffalo Chicken Sliders make entertaining easy. Little buns sandwich cheesy, spicy shredded chicken, ready to be served to hungry guests. 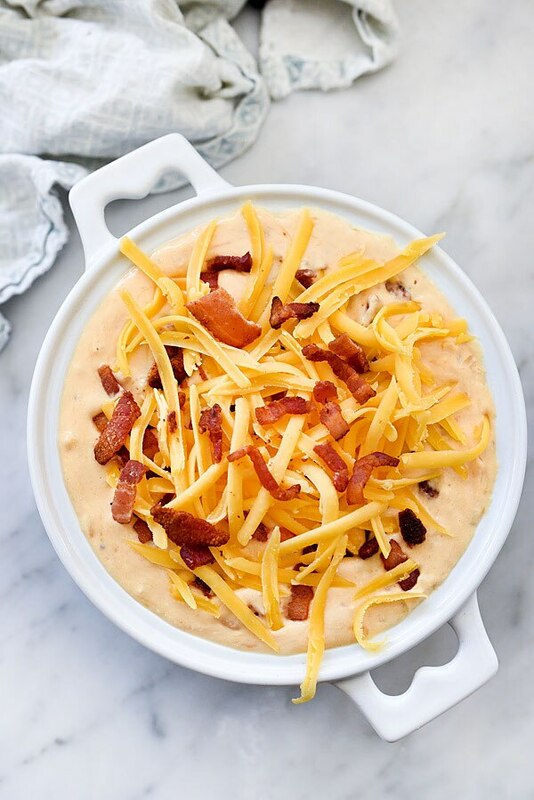 This Bacon & Beer Cheese Dip is the gold standard of appetizer deliciousness. 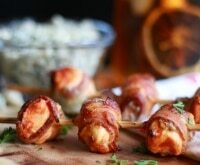 There’s no way a recipe can fail when bacon, beer, and cheese are involved! Let your slow cooker get these Cheesy Potato Skins ready for guests. 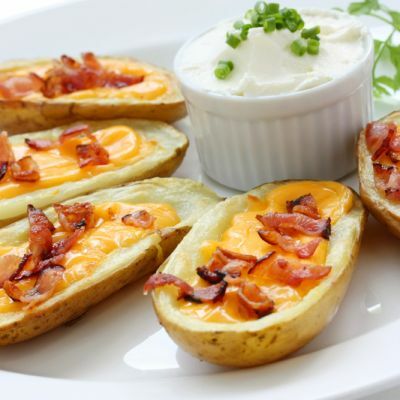 Hot and cheesy, bacon takes these potato skins over the top.